Figure 165 A good example of an openness cluster. The palms are fully exposed in the submissive position and the fingers are spread wide to give more impact to the gesture. The head is in the neutral position and the arms and legs are apart. This man is communicating a submissive, non-threatening attitude. Figure 166 This is a classic deceit cluster. As he rubs his eye he looks away towards the floor and both eyebrows are raised to the disbelief position. His head is turned away and down, showing a negative attitude. He also has an insincere, tight-Tipped smile. 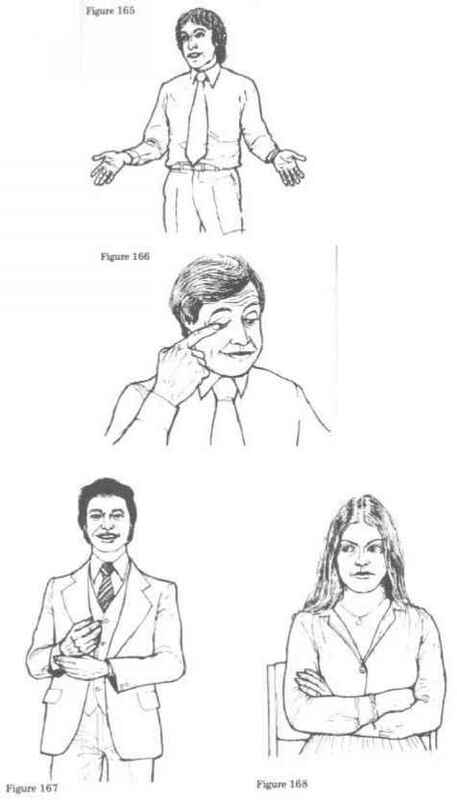 Figure 167Inconsistency of gestures is obvious here. The man is smiling confidently as he crosses the room but one hand has crossed his body to play with his watch and form a partial arm barrier which shows that he is unsure of himself and/or his circumstances. Figure 168 This woman disapproves of the person at whom she is looking. She has turned neither her head nor body toward him but is giving him a sideways glance with her head slightly down (disapproval), eyebrows slightly turned down (anger), a full arm-cross gesture (defensive) and the corners of her mouth are turned down. chair with wheels and he has a telephone with a lock on it. He is also sitting in the defensive/competitive position. Figure 170 The hands-on-hips gesture is used by the child to make herself appear larger and more threatening. The chin is jutting forward to show defiance and the mouth is opened wide to expose the teeth, just as animals do before they attack. Figure 171This cluster can be summed up in one word - negative. 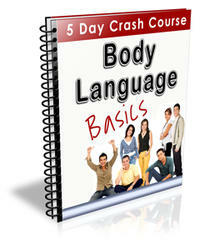 The folder has been used as a barrier and the arms and legs are folded due to nervousness or defensiveness. His coat is buttoned and his sunglasses hide any eye or pupil signals. Much of his face is hidden by his beard, which gives him a suspicious appearance. Considering that people form 90 per cent of their opinion of someone in the first ninety seconds it is unlikely that this man will ever get to first base with another person. 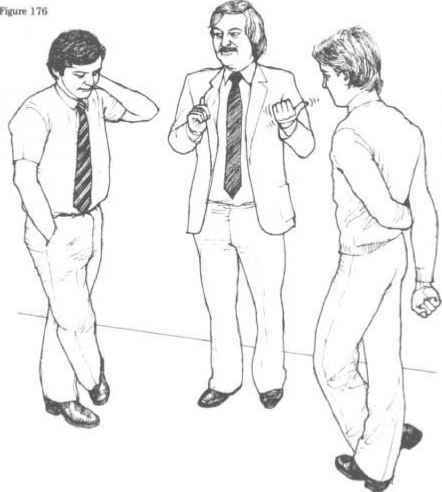 Figure 172Both men are using aggressive and readiness gestures, the man on the left using the hands-on-hips gesture and the man on the right the thumbs-in-belt. The man on the left is less aggressive than the man on the right as he is leaning backwards and his body is pointing away from the man on the right. The man on the right, however, has assumed an intimidating pose by pointing his body directly at the other man. His facial expression is also consistent with his body gestures. 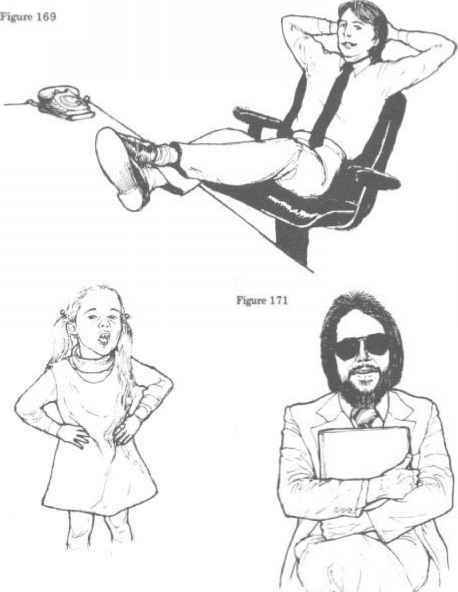 Figure 173The man on the left is straddling his chair in an attempt to take control of the discussion or to dominate the man on the right. He is also using the direct body point at the man on the right. He has clenched fingers and his feet are locked together under his chair, showing a frustrated attitude, which means that he is probably having difficulty in getting his point across. The man in the centre feels superior to the other two because of the hands-behind-head gesture he has taken. He also has the figure 4 leg lock position, meaning that he will compete or be argumentative. He has a high-status chair that swivels, leans back and has wheels and arm rests. The man on the right is seated on a low-status chair that has fixed legs and no accessories. His arms and legs are tightly crossed (defensive) and his head is down (hostile), indicating that he does not buy what he hears. 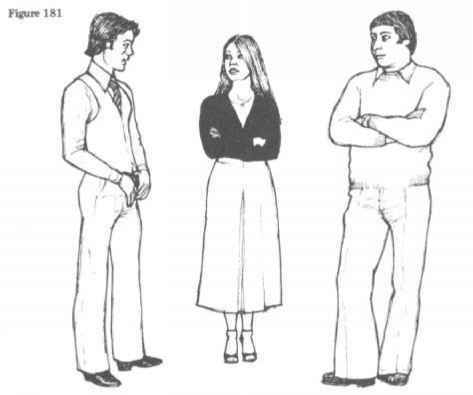 Figure 174The woman is displaying the classic courtship gestures. 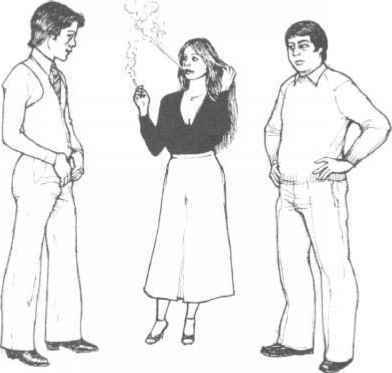 She has one foot forward, pointing towards the man on the far left (interest), a combination of hand-on-hip and thumb-in-belt (sexual readiness), her left wrist is exposed and she is blowing cigarette smoke upwards (confident; positive). 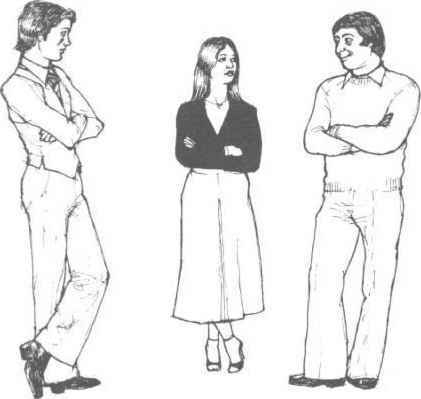 She is also giving a sideways glance to the man on the far left and he is responding to her courtship gestures by adjusting his tie (preening) and pointing his foot at her. His head is up (interested). The man in the centre is obviously unimpressed with the other man as he has his body pointing away and is giving him an aggressive sideways glance. He has his palms out of sight and is blowing his cigarette smoke down (negative). He is also leaning against the wall (territorial aggression). Figure 175The man on the left is using superiority gestures and appears to have an arrogant attitude towards the man sitting opposite. He is using the eye block signal as his brain attempts to block the other man from sight and his head is tilted back to 'look down his nose' at him. Defensiveness is also evident as his knees are held tightly together and he is holding his wine glass with both hands to form a barrier. 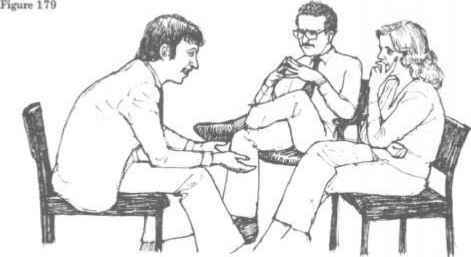 The man in the middle has been excluded from the conversation as the other two men have not formed a triangle to include him. He does, however, seem quite aloof as shown by his thumbsin-waistcoat gesture (superiority), he is leaning back on his chair and is using a crotch display. His head is in the neutral position. The man on the right has heard enough and has taken the starter's position (ready to leave) and his foot and body are pointed toward the nearest exit. His eyebrows and the comers of his mouth are turned down, and his head is slightly down, all of which demonstrate disapproval. 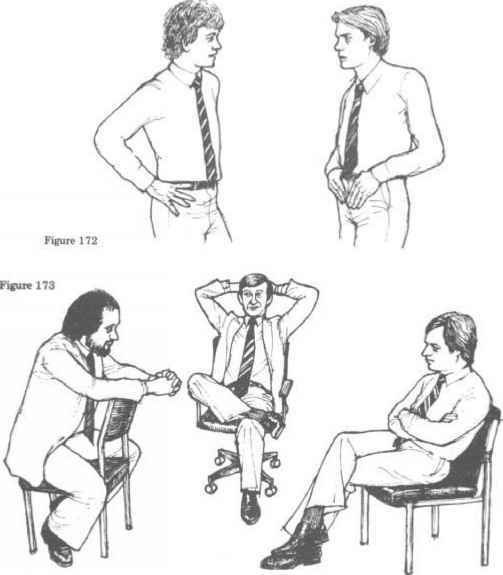 Figure 176The man on the left and the man on the right have taken the closed body formation to show the middle man that he is not accepted into the conversation. The middle man's attitude shows superiority and sarcasm and he is using the lapel-grasping gesture with a thumb-up (superiority) plus a thumb-point gesture toward the man on his left (ridicule) who has responded defensively with crossed legs and aggressively with the upper-arm grip gesture (self-control) and side-ways glance. The man on the left of this sequence is also unimpressed with the middle man's attitude. He has crossed legs (defensive) palm-in-pocket (unwilling to participate) and is looking at the floor while using the pain-in-neck gesture. Figure 177This sequence also shows a tense atmosphere. All three men are sitting back in their chairs to keep the maximum distance from each other. The man on the right is causing the problem because of his negative gesture cluster. As he is speaking he is using the nose touch gesture (deceit) and his right arm has crossed his body to make a partial arm barrier (defensive). 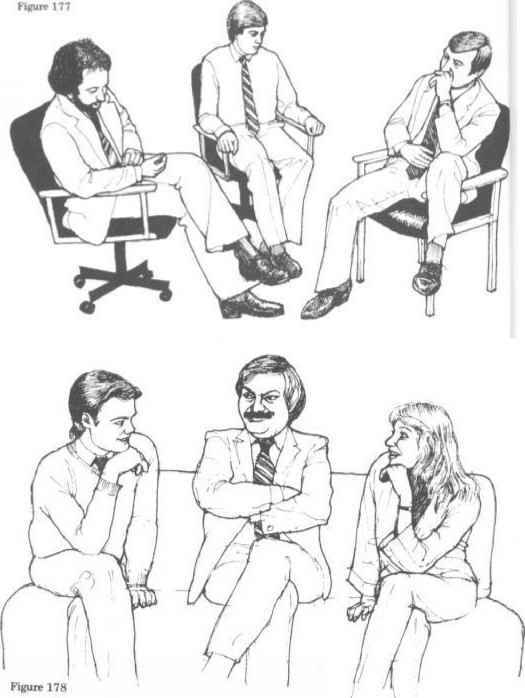 His lack of concern about the other men's opinions is shown by the leg-over-chair gesture and his body is pointed away from them. The man on the left disapproves of what the man on the right has to say as he is using the lint-picking gesture (disapproval), his legs are crossed (defensive) and pointed away (uninterested). The man in the middle would like to say something but is holding back his opinion, shown by his selfrestraint gesture of gripping the arms of the chair and locked ankles. He has also issued a non-verbal challenge to the man on the right by pointing his body at him. Figure 178In this scene the man on the left and the woman have mirrored each other's gestures and are forming 'bookends' on the couch. The couple are very interested in each other and have positioned their hands in such a way that they can expose their wrists and they have crossed their legs toward one another. The man in the middle has a tightlipped smile which can make him appear interested in what the other man has to say but it is not consistent with his other facial and body gestures. His head is down (disapproval) his eyebrows are also down (anger) and he is giving the other man a sideways glance. In addition to this, his arms and legs are tightly crossed (defensive), all indicating that he has a very negative attitude. Figure 179The man on the left is using an excellent gesture cluster to convey openness and honesty - exposed palms, foot forward, head up, coat unbuttoned, arms and legs apart, leaning forward and smiling gestures. Unfortunately for him, however, his story is not going across. The woman is sitting back in her chair with her legs crossed away (defensive), she has a partial arm-barrier (defensive), a clenched fist (hostile), head down and is using the critical evaluation gesture (hand to face). The man in the middle is using the raised steeple gesture, indicating that he feels confident or superior, and he is sitting in the figure 4 leg position, showing that his attitude is competitive or argumentative. We assume that his overall attitude is negative, as he is sitting back, his head down. The following three figures show a party scene that demonstrates typical defence, aggression and courtship gesture clusters. Figure 180 The three people all have their arms folded, two have their legs crossed (defensive) and all have their bodies oriented away from each other, all indicating that they have just met for the first time. The man on the right is very interested in the woman as he has turned his right foot around to point at her and he is giving her a sideways glance, combined with raised eyebrows (interest) and a smile; he is leaning towards her with the upper part of his body. Figure 181The non-verbal attitudes have changed. The woman has uncrossed her legs and is standing in a neutral position, while the man on the left of the sequence has uncrossed his legs and is pointing one foot at her (interest). He is using the thumbs-in-belt gesture which is intended either for the other man, in which case the attitude is one of aggression, or for the benefit of the woman, making it a sexual signal. He is also standing straighter to make himself appear bigger. The man on the right seems to have become intimidated by the other man, as seen by his more erect stance, and he is giving the man on the left a sideways glance combined with eyebrows down (disapproval) and his smile has gone. Figure 182The attitudes and emotions of those people are now clearly shown by their gestures. The man on the left has kept his thumbs-in-belt, foot-forward position and has turned his body slightly towards the woman, making it a complete courtship display. His thumbs are also gripping his belt much tighter to make the gesture more noticeable and his body has become even more erect. The woman is responding to this courtship display with her own, showing that she is interested in being involved with the man. She has uncrossed her arms, turned her body toward him and is pointing one foot at him. Her courtship gestures include hair touching, exposed wrists, chest forward with exposed cleavage and positive facial expression, and she is blowing her cigarette smoke upwards (confidence). The man on the right appears unhappy about being excluded and is using the hands-on-hips gesture (aggressive readiness) to show his displeasure. In summary, the man on the left has won the woman's attentions and the other man should look elsewhere for a partner.